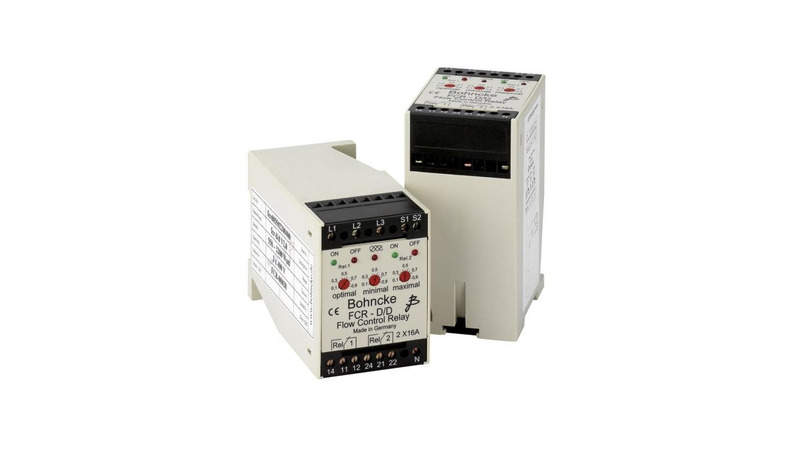 This new by Bohncke developed electronically filter control relay with integrated dry run protection and overload relay is connected in the current supply cable. In bigger plants it also can be placed in the switchboard on a C-rail. lt analyses the Phase angle between motor current and tension which is used to determine the motor load. Ist function is very simple. Three adjustable switch levels control two solid industrial 16 A alternating relays. The maximum switching level (overload level) switches one relay. The minimum switching level (underload / dry run level) switches the same relay without any delay. The optimum switching level switches the other relay as soon as motor load falls below the adjusted level (lowest flow level for the filters). The filter and pump protection relay is available in two different types, FCR 2 and FCR 5 for the current from 0,1 up to 2 A and from 1,0 up to 5,0 A. For higher loads they can be used with a transducer. Bohncke GmbH delivers this relay complete with fuses, a magnetic switch, line-up terminals, fault indication and luminous push button switches in a plastic housing IP 65. If the filter unit is switched of no light is illuminated. lf switched on white is illuminated. When the capacity has fallen below the optimum level a yellow light is illuminated. The switch-board was designed in that way, that it has to be reset by pushing the off push button switch as soon as it was switched off caused by the maximum or minimum switch-level. All contacts are connected with line-up terminals. In this way the switch-board can easily be connected to and be controlled by an SPS.